While walking through a local shop, I encountered a statue of Ganesha that spoke to me, loudly. I tried to leave it where it was, but I just couldn’t. I had to purchase it. I stepped up to the counter and paid. I couldn’t stop the smile that spread across my face. Ganesha definitely had something to say to me. When I arrived home, I laid out a beautiful cloth that was made in India. Atop the cloth I placed an incense burner, two yellow candles, the statue I’d just purchased, and a framed image of Ganesha (pictured to the left). After lighting his incense and candles and saying a prayer from Loving Ganesha, I stilled my mind and allowed his message to take shape. He said – in a rather vivid encounter – “Express your joy” and “Let it flow.” The first message was straight forward. I am an incredibly happy person who sometimes neglects or outright forgets her joyous core. Joy is a powerful piece of who I am and I don’t feel like me if joy is not being expressed freely in multiple forms. Usually in song, but also in thought, speech, and deed. The second message – “Let it flow” – took a few minutes of pondering before I could really connect with its meaning. Basically, I tend to be very guarded when I do not feel heard, when I feel like my Self is not being recognized, understood, and received. This feeling has been steadily increasing for years now. 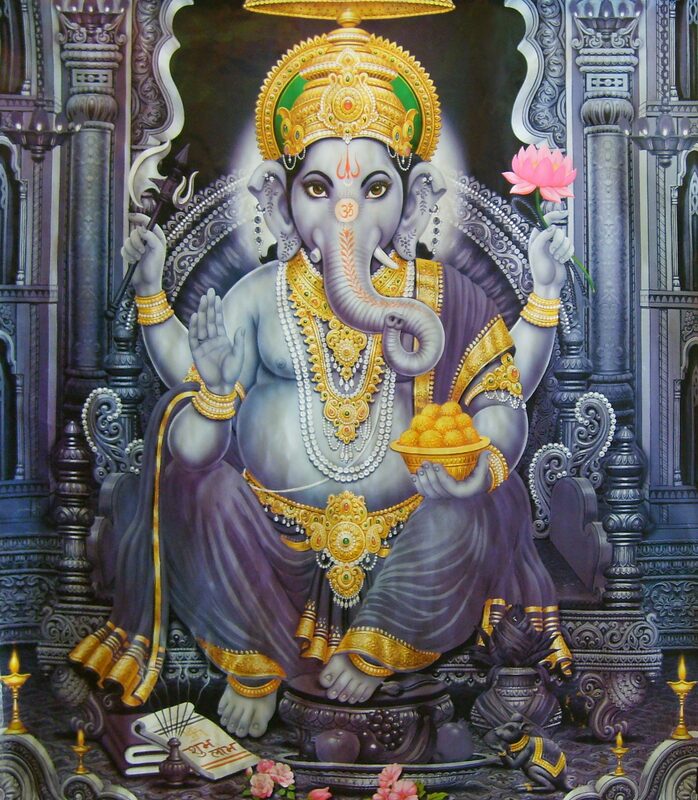 Ganesha indicated that my feeling of being trapped within myself and simultaneously misunderstood by others is not how it has to be; that feeling does not have to persist. Ganesha invited me to let down my guard and let my Self – whoever that Self may be – flow and take shape without derogation or derision. Love and acceptance poured from him. It was incredibly refreshing and healing. I cried. I was really grateful that he took the time to tell me that Self is a right and it is always taking shape, always becoming and that we need to express that becoming Self boldly, fully, and without shame. However, I was also extremely frustrated that a god had to take time out of their busy schedule to tell me something that I really I should have known already. I did know this already, right? I’m not stupid, am I? Was I born yesterday? Am I not 30 years old? What 30 year old still needs to be told that they are worth while. That’s something we should just know, right? We should, right? When I received my master list of shoulds and should nots from The Office of 30-Year-Old Affairs when I turned 30, I am pretty sure that was on there, wasn’t it? This is the sort of frustrating line of questioning and self-doubt that happens when only one tiny sliver of one’s being (e.g. the mind) knows and understands an important piece of wisdom but the rest of the being (e.g. body and spirit) does not know and understand it. In my case, intellectually I know that I have a right to be Me, mySelf but apparently I do not believe that – do not believe in the worth of that Self – and so important spiritual pieces in the puzzle get lost or more damaged than usual when the puzzle box is shaken. I see the pattern, there’s no denying it. Makes no sense to pretend. There it is. That’s one of my spiritual hurdles. Self worth. Arggh! Just when I start to shake it out like Florence Welch, it grows claws and digs in deep. Damn! Now I have to redouble my efforts to truly know on multiple levels – mental, physical, spiritual…yes, down to my core…to accept completely – that there is nothing Wrong with me a being, as spirit-soul. I am worthy. Worts and all. “Without derogation or derision” says Ganesha. Hmm, I have to figure that part out. That’s hard. Too many shoulda, coulda, wouldas, shaking around in my psyche, too much shame. I accept my Self as I become, without derogation or derision, because I am a beautiful part of the divine plan manifesting itself. Wow, that feels weird on my tongue. I have to figure out how to unweird it. I repeat, damn! This is hard. I recall again Ganesha’s love and acceptance. When I think about how wonderful it felt to have that kind of love and acceptance of my Self, that feeling reminded me of related messages I have received from other deities over the last several months (Freyja and Dionysos, especially). This self worth issue has neon lights around it and a runway strip pointing to it. This is big. This needs attention. No, more specifically I need my attention. Holy Modaka! I have to take care of myself at the spirit level, soul level. Whoa there, back the bus up. What? I repeat for the third time, damn! I don’t know how to do this. Oh wait, They will guide me. Yay! Oh, I have to do the work myself though. I knew that and I respect that, but DAMN anyway! Ok, I’m back. I’m ready. I can do this. I am doing this. It is in the process of getting done. I am making progress. One foot in front of the other. I see now that because of the self-worth issue I often feel I need permission. A few kind lords and ladies have taken it upon themselves to guide me in sorting through some of the big pieces of this issue. I still find that more than a little shocking and very frustrating because I feel like I am keeping deities from other things. Do they really need to spend time thumping my skull? Ugh! Well, I have decided to trust that they don’t need me telling them what other, better things they could be doing. When they have something to say, they will say it. When they don’t, they won’t. It’s really that simple. If they want to offer guidance, I’m not going to detour them and I’ll try not to make myself feel bad about it. And so, with my worts and all, I say thanks again to Ganesha (and also Freyja and Dionysos) for loaning me a chisel to shape my inner labyrinth. In the coming weeks I plan to do a larger offering for him of flowers, incense, and sweets. Mmm, modaka :D.
This entry was posted in Divine Encounters, Labyrinth and tagged God Dionysos, Goddess Freyja, Lord Ganesha, Offerings by Wandering Woman. Bookmark the permalink. Ganesha has had a place of honor on my Altar for sometime now. I love Ganesha and don’t be so hard on yourself, some of us just never seem to out grow the “Own Our Own Self Worth” train of thought. Maybe we should put that on a tee shirt. And I have also found that Ganesha likes milk!